FANTASTIC - love that yellow blazer!! what a cute theme week! yellow is my favorite color and i love how it looks with gray! That yellow is gorgeous! I can't believe you haven't worn it a gazillion times before already! Thank you for debuting the yellow blazer--looks great! Oooh, I love this idea! I have many items I think I wear far more often than I do. I should do a One Hit Wonder week. LOVE that yellow jacket on you! It definitely needs to be worn as much as humanly possible. 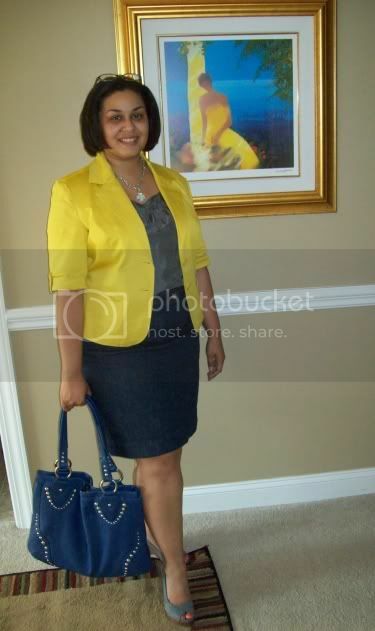 That yellow is sooooo summery and fabulous, especially with that gorgeous blue bag. I am in love with this look!! Oh, that blazer is absolutely GORGEOUS! The yellow and blue is my favorite combo. I need a yellow cardigan :). Oh, I am coveting this jacket so badly! Love the combo with the grey and denim. The blazer is crazy! Again...you rockin the color...so well I might add. Sarah, Natalie, CBenevidas, Frances Joy - Thanks so much! This jacket is gorgeous on you! And I LOVE yellow paired with grey - one of my favorite color combos! I love your idea of one hit wonders week. I can't believe how much stuff you've only worn once! Whenever I come across stuff like that in my closet, I either force myself to wear it again or just get rid of it. Can't afford the lost closet space! I love that yellow jacket! Looks great with the grey top and denim skirt!